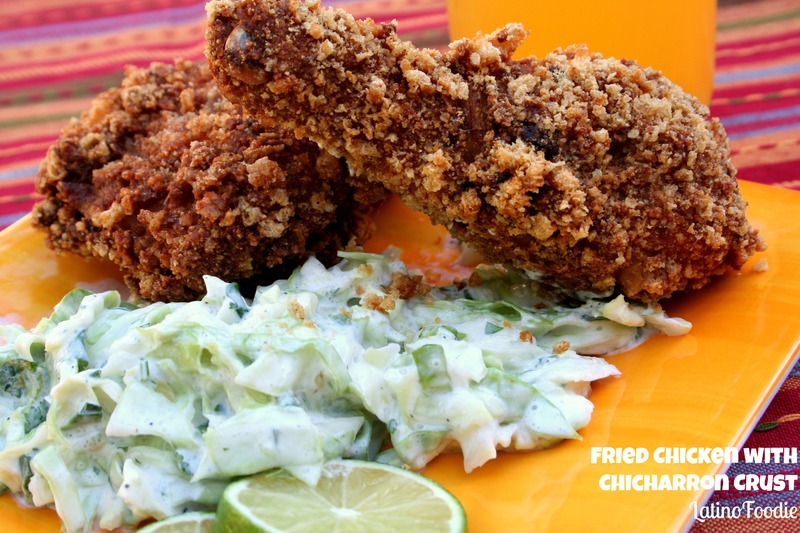 In this fried chicken recipe below, I have flavored the egg wash with a Louisiana-style hot sauce to marinate and season the chicken. The meat turns out so juicy and tasty from the vinegar and heat of the hot sauce. The key is to let the chicken bathe in the egg wash with the hot sauce for at least a few hours to soak up all of the goodness in flavor. Yet, the part of this recipe that makes my mouth water right now as I am typing this post are the chicharrones (fried pork rinds). I replaced traditional bread crumbs for crushed chicharrones. The chicken is crunchy and the taste is out of this world. Cook’s Note: Be careful when pulsing the chicharrones in the food processor as if you let it go too long the crumbs become too fine and you’ll lose some intensity of the pork flavor. In a medium size bowl, beat the eggs with buttermilk. Add enough hot sauce (I used a whole bottle) so the egg mixture is bright orange. Whisk in the salt, pepper and garlic powder. Add the chicken to the bowl, making sure the chicken is fully submerged, or add everything into a sturdy Ziploc bag. Refrigerate up to 2 hours. Begin heating your oil in a deep pot. The ideal frying temperature is said to be 365°F. Alton Brown claims that 325°F gets his chicken just right. We went with 350°F for this recipe. Do not fill the pot more than 1/2 full with oil. In its own bag, crush the chicharron or place in a food processor and pulse until it becomes crumbs. We went back and forth on how fine to crush the pork rinds. Personally, we preferred the rough crumble. In a shallow pie pan, combine the flour and pepper. Do the same in a separate pan for the crushed chicharrones. When the oil is hot enough you can roll the seasoned chicken in the flour mixture, shaking off the excess. Then coat the chicken in the egg and buttermilk mixture one last time before rolling into the crushed chicharrones. Using thongs begin frying the chicken in the oil until brown and crisp, flipping the chicken halfway through the cooking process. Dark meat takes longer than white meat. It should take dark meat about 14 to 15 minutes, white meat around 8 to 10 minutes. Drain on paper towels before enjoying. This is a brilliant idea. I have to try it out. I had never thought about something like this before. Absolutely!!! We love cooking in thongs, boxers, or comando!! LOL!! !